Dylangate. Are we inside Eden…or outside? Before Christmas last year, I saw Bob Dylan’s Exhibition at the Halcyon Gallery. It was still on the other day, and I hadn’t really decided what I thought about it – was it more than just a whimsical celebrity driven event? Cards on the table – I’m a huge Dylan fan. I was not too impressed the first time I saw his prints and drawings. They seemed too naive to be true – but now it seems to be a part of his wandering American minstrel persona. Now there were three more flavours to choose from. The exhibition at the National Portrait Gallery had heads in the original style. But at the Halcyon there were Gates. 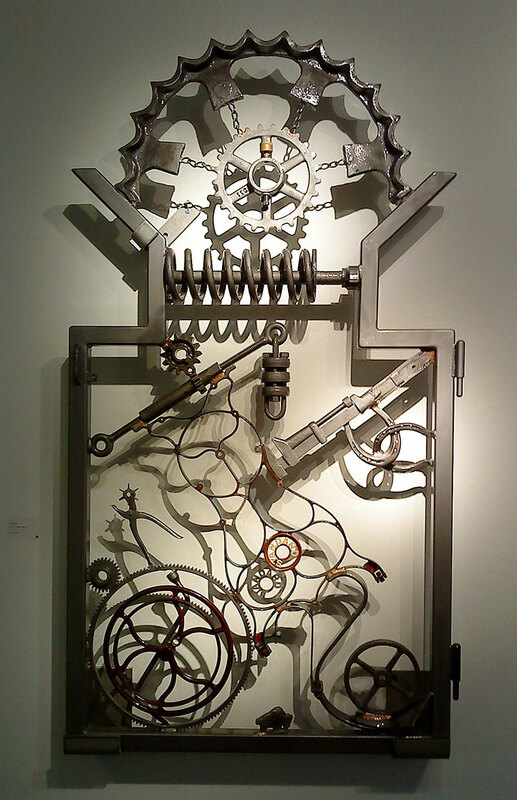 Big bits of scrap metal and tools welded together to form gates, fences and tables. 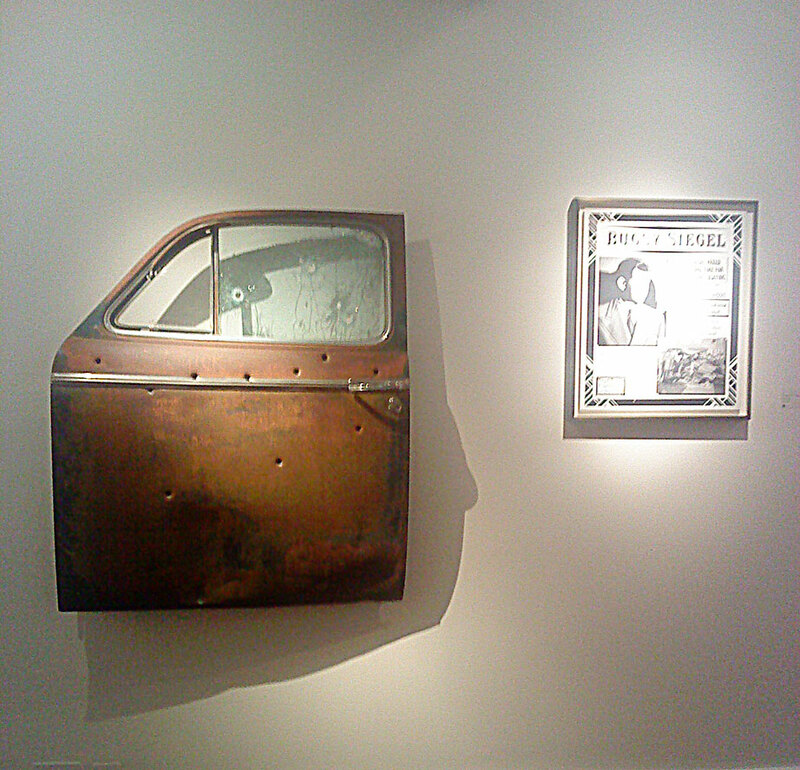 Not just that but in the basement there were satirical photoprints of mock magazine covers and also a series of bullet holed rusty old car doors mounted alongside hagiographies of old time gangsters like Bugsy Siegal. Very strange. It all had me scratching my head and wondering what I was looking at. Bugsy loses his No Claims Bonus. Why did he make it at all? Was it just a hobby he had run out of storage for? Like many great artists Dylan is always looking for new territory. Reinventing oneself is sometimes a euphemism for a nomadic tendency to move on; but this is nothing to be ashamed of. Dylan is in good company – Picasso for one was such a restless spirit. But I am fairly sure he never released a solo album. What are the gangster pieces saying? It seems to allude to their colourful lives and violent ends as something from the past worthy of some iconic veneration. Likewise the faked magazine covers seem nostalgic for a lost culture of print magazines – the ancestor of our cultures of celebrity and advertising – whilst mocking them with a very straight face. Inevitably we have all listened to The Gates of Eden again. His iconic 1965 recording is one of the few that he has not reinvented (as far as I know). It describes a paradise where the struggles and injustice of the world is unknown. Although it seems to be close at hand, Eden is clearly an unattainable utopia, and those who seek it are seen to be as foolish as those they seek to escape are wicked. Never has the tension between the gentle acoustic guitar and the bitterness of the lyrics been clearer. Are we any nearer that idyll than we were fifty years ago? Much of what was radical then seems mainstream now. There is an apparent unanimity about liberal values and equality that makes me uneasy. As we float along in a virtual bubble of internet confirmation sometimes it might seem that conflict and bigotry have been banished to parts of the world where the 1960s never happened. But then we look up from our bunker and see the entrenched views over there. When I listen to the excellent Theme Time radio show which Dylan hosted, he moved his role subtly from that of a performer to that of a chronicler – an almost Chaucerian gatherer of voices of a vanished world of music. Would it be too much to think that his sculptures and drawings do the same for parts of American life – metal tools, magazines, gangsters – grounded in a physical reality, but now fading in the collective memory. Today we look at Dylan as part of the Americana – the narrative of the 20th century, and yet he is still here. He knows that he is part of that story but when he is writing or indeed welding about it he is detached as an artist must be. It is as if Dylan is talking to us through a mask of his own image. Eden is a Utopian vision that exists in the mind of the artist. We are not inside Eden, but maybe Dylan is and he probably always was. This entry was posted in Art, Galleries, London, Sculpture, Uncategorized and tagged 1960s, Americana, Art, Bob Dylan, Dylan, Dylan Gate, Galleries, Gangsters, Gates, Halcyon gallery, London, magazine covers, National Portrait Gallery, Picasso, Sculpture, Swinging Sixties, Welding, West End.